Ascending Butterfly: February 2010: The Ascending Butterfly Book Club review & GIVEAWAY - Featured Book in the Spotlight! February 2010: The Ascending Butterfly Book Club review & GIVEAWAY - Featured Book in the Spotlight! This giveaway is now CLOSED. Thanks so much to our wonderful sponsor Simon & Schuster and Author Reyna Grande, We look forward to working with you again! Congratulations to our winner 'Cynthia'. Remember: There are still some great giveaways active on the upper right hand side of the page! To the avid readers amongst us we apologize, after a long hiatus, The Ascending Butterfly Book Club is back! I thorougly enjoyed reading February's title, and couldn't possibly love this book or the name more, I present to you, 'Dancing With Butterflies' by Reyna Grande. Folklórico, traditional Mexican dance, bring together four women in Los Angeles. Yesenia and her husband lead Alegría, a successful Folklórico dance group, but Yesenia’s arthritic knee keeps her offstage and restless in her marriage. Sisters Elena and Adriana grew up dancing in Alegría, but bitterness over their difficult childhood has soured their relationship. And Soledad, the group’s costume designer, is determined to open a dress shop in L.A., even though she is in the U.S. illegally. Tragedy strikes each of these four women, leaving Alegría’s future in doubt. Yesenia tries to reshape her body through cut-rate plastic surgery in Tijuana. Elena’s new marriage breaks up after her baby is stillborn, and instead of dancing through her grief, she lusts after an underage dancer. Adriana, missing her abusive father, chases oblivion through a series of dangerous relationships. Soledad sacrifices her career dreams to bid goodbye to her ailing grandmother, but, trapped on the Mexican side of the border, must risk her life to return to her family, to her passions, and to Alegría. These four women, bonded by their passion for Folklórico, will learn to heal together, to keep Alegría dancing another day. 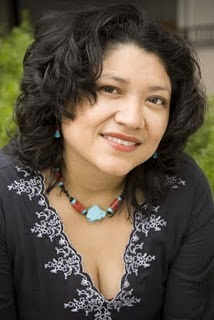 Reyna Grande is the author of the critically acclaimed novel Across A Hundred Mountains (Atria 2006), for which she received an American Book Award (2007) and El Premio Aztlan Literary Award (2006). Her latest novel, Dancing with Butterflies, was published in October 2009 to rave reviews. Born in Mexico in 1975, Grande was raised by her grandparents after her parents left her behind while they worked in the U.S. She came to the U.S. at the age of nine as an undocumented immigrant and went on to become the first person in her family to obtain a higher education. She has a Bachelor of Arts degree in Creative Writing and Film and Video from the University of California, Santa Cruz, and an M.F.A. in Creative Writing from Antioch University. She is a sought-after speaker at middle/high schools, colleges and universities across the nation, and teaches creative writing workshops in Los Angeles. She has served as a judge for the Pen Center USA Literary Awards and is on the planning committee of the Latino Book & Family Festival. She is currently at work on a memoir. 1. Four distinct voices lead us through Dancing with Butterflies: each woman has her own, unique style of narrating. Please tell us about the experience of writing from four different points of view. How did you develop their separate voices? Was one narrator harder to envision than the others? Answer: My first book, Across a Hundred Mountains, is told from two points of view. It gave me the training I needed to tackle four different characters. I used the same techniques I had learned in Mountains—pay attention to the voice, the way the characters talk, the way they see the world around them. I also worked on each character individually, spent a lot of time trying to get to know each woman, without the distraction of the other three. Having said that, writing from four points of view was a lot harder than I imagined! I think for my next book I will try just one. The hardest character for me was Yesenia. Since she’s ten years older than I am, and is going through a different stage in her life, I was having a difficult time getting into her head. I ended up using my older sister as a model for Yesenia, and sometimes, when I was stuck, I would call my sister and say, “So tell me again about the time you….” Adriana was the easiest for me because I understood her. I grew up with an alcoholic father who physically abused me for many years, and later on, in my twenties, I too was looking for men that were like my father (not physically abusive, but controlling). Luckily I escaped those relationships and got over that right away, and I found a wonderful man to marry (like Ben!). 2. Each chapter opens with one of your graceful line drawings of Folklórico dancers. Why did you choose to include these drawings? Have you ever felt you had to choose between two art forms, as Adriana struggles to choose between dancing and ranchero singing? Answer: The drawings came very late in the process, right before I turned in the final draft to my editor. I had thought about it for a long time. Because I was writing about such a visual topic—Folklórico—I felt that the drawings would complement story. I couldn’t find someone to do them, and I didn’t feel confident enough to do them myself. But one day I said, why not? Why not at least try? So finally I decided to do them myself, just to see. And I ended up liking them enough, and when I showed them to my editor she liked them, too. Like Adriana, I felt torn between the passions I had. I loved music and from 7th grade up until my first year of college, I was a member of the marching band (I marched the Rose Parade three times). From middle school to college, I took drawing and painting classes because I loved doing that, too. I also started writing when I was thirteen years old. At UC, Santa Cruz I met a teacher who once told me that even though it was a good thing that I had many passions (I was also doing film and dancing at the time that I met her), I needed to choose one thing that I really loved, above all others, so that I could focus on it and be great at it. Otherwise, as the saying goes, I would just be a jack of all trades. So I chose writing. I’m glad I listened to her, because otherwise I wouldn’t have been able to complete my first novel, which requires a lot of discipline and commitment, but once in a while I still dance Folklorico, and I still draw. Having my drawings included in Dancing with Butterflies was, what can I say, extremely fulfilling—to see two of my passions come together, at last. 3. Sibling rivalry is a prominent theme in the novel, with Elena and Adriana’s constant conflict, as well as Soledad and Stephanie’s less explosive rivalry. Why did you focus on siblings in this novel? With Soledad and Stephanie, I wanted to write about siblings that belong to two worlds. Most immigrant families have siblings who were born in this country and others born in other countries. Even in my own family, my two youngest siblings were born here in the U.S., but the three oldest (myself included) were born in Mexico. 4. Soledad faces enormous challenges in her efforts to cross the U.S.-Mexican border. What inspired Soledad’s story? Answer: Soledad was the last character to make an appearance. One day when I was at Mr. Vences’s house (the director of the dance group I researched), Elías Roldán, the group’s costume designer, was there, showing Mr. Vences a costume he was designing for the group. As I watched them talk about the costume and what changes needed to be made, I realized that I was missing a crucial part in my novel—the point of view of Alegría’s costume designer! Mr. Roldán was very generous with his time, and I visited him at his house to interview him several times. Like Soledad, he used his dining room to do his sewing, and every corner of the living room and dining room was covered in bolts of cloth. In the interviews he not only talked about costume making and cloth, but he shared with me his dream of having his own shop and everything that was keeping him from making his dream come true. But now I’m happy to say that Mr. Roldán has his own shop in East L.A., and his business is thriving. Although Dancing with Butterflies ends before Soledad makes her dream come true, this is the kind of future I envision for her. In terms of the challenges she faced crossing the border, it was inspired by all the stories I hear from immigrants that have had to make the dangerous journey north (myself included). 5. Despite all the challenges that your characters face, there are many light-hearted moments, as well. How did you manage to balance serious subjects and humor? Do you have a favorite humorous moment in the novel? Answer: I tend to write depressing stuff, and writing funny isn’t my strength. Whatever funny moments appear in the novel were not planned. But a little humor goes a long way, and it gives the reader a break from all that sadness, so I’m glad I managed to have a few funny moments here and there. One of my favorite humorous moments is when Adriana and Ben go out for sushi and she mistakes the wasabi for Guacamole. I was twenty years old when I first had sushi, and like Adriana, I was very ignorant about what wasabi was. I put a lot of it on my sushi, and boy, did that hurt! 6. Frida Kahlo is featured prominently in the novel, as Adriana’s favorite artist. How does Kahlo’s work affect you? Answer: Frida Kahlo is an inspiration to many Latinas. She was a fighter. For most of her life she was in deep physical (and emotional) pain. Yet, her passion for art helped carry her through the toughest moments of her life. Writing has been my salvation. When things got bad at home, I wrote. Writing kept me sane. Kahlo painted herself many times. When I write, I use myself as the starting point for my characters. Elena, Adriana, Soledad, Yesenia, they are all a facet of me. They are not self-portraits, no, not like Kahlo painted her self-portraits. My self-portraits (my characters) are drawn in a style like Picasso’s, very distorted, but somehow recognizable. Like Adriana, my favorite Kahlo painting is “The Two Fridas.” When I lived with my father, I developed a second personality, another Reyna, so to speak. One Reyna was afraid, depressed, lonely. But the other Reyna was strong, brave, and smart. When things got tough, that second Reyna was the one that would give me the push I needed to keep going. I could hear her in my head telling me, “Things won’t always be like this. One day they will be better.” When I saw “The Two Fridas,” I saw my dual personality represented in that painting, and I fell in love with the painting and with the woman who painted it. 7. 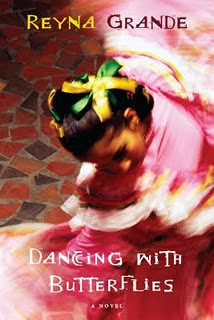 Although the main characters in Dancing with Butterflies are Mexican or Mexican-American, they face many of the same problems as women from other backgrounds and cultures. Which of the characters’ challenges do you feel are the most universal? Which feel more culturally specific to you? Answer: Just a few weeks ago my older brother asked me why I don’t write books with no Latino characters or themes. He said that I am “limiting my audience” and therefore (or so I read between the lines) I will never have a bestseller. At first I felt furious about his comment, especially because I was showing him the advance copy of Dancing with Butterflies and instead of just saying, “Good job, Reyna,” he asks me that question! (Sibling drama? Yes!) But the thing is that even though I write about Latino characters, ultimately I am writing about human beings. No matter what ethnic background we come from, first and foremost we belong to the human race. The problems the women in Dancing with Butterflies face are universal. Like Yesenia, who hasn’t thought about aging and being frightened by it? Who hasn’t thought about the body’s limitations and what it can and cannot do as we get older? Elena gave birth to a stillborn baby. What mother, at some point during a pregnancy, hasn’t feared the worst? And for some, no matter their ethnic backgrounds, the worst has come to pass. What culture hasn’t had sibling rivalry, dead relatives to mourn, dreams that haven’t come true, obstacles to overcome, marriages that fail, illicit love affairs, forbidden love? 8. Your first novel, Across a Hundred Mountains, also centers on immigration and families. Do you plan to continue these themes in your future work? Answer: I like to write about things that are important to me. My older sister once asked, “Why are you always writing about Mexico?” My father once said, “Why don’t you just forget about the past and move on? Why do you need to write about it?” I write about things that I care about, that matter to me. The immigrant experience is one of them. Right now I am working on a memoir in which I write about my childhood in Mexico, living in poverty, being raised by my grandmother because my parents were here in the U.S. working. I write about what it was like to come here as an illegal immigrant and the difficulties of trying to close the gap created by eight years of separation between me and my father. So to answer the question, yes, I do plan to continue writing about immigration and families, among other things. I am always looking for new ideas and topics. One has to grow as a writer, and one way to do that is to take chances and try new things. 9. At one point, Elena realizes that her ex-husband never understood her passion for dancing. Do you think artists need to connect with other artists in order to share their passions? Answer: I think that it is very hard for nonartists to understand an artist’s inner world, needs, and thoughts. But it doesn’t mean you can’t try! I think it is very important for artists to build friendships with other artists. I have been lucky to have made many writer friends, especially female writers. We get together sometimes for coffee, or communicate through email or phone calls. We critique each other’s works, talk about our goals, our dreams, our troubles with our respective partners, our children, our editors, our publishers, our readers. I think that artists need to have a support network and spend time with those who understand, those who are walking the same difficult path. I have made it a point to reach out to other writers. For example, this year I am helping to organize the Latino Book & Family Festival in Los Angeles to reach out to other writers and have us come together, for at least one weekend, to share our passion for the written word, not only with each other but with the community. I love my writer friends. They understand me in a way my own family never will. 10. Your first novel, Across a Hundred Mountains, also centers on immigration and families. Do you plan to continue thesethemes in your future work? Answer: I like to write about things that are important to me. My older sister once asked, “Why are you always writing about Mexico?” My father once said, “Why don’t you just forget about the past and move on? Why do you need to write about it?” I write about things that I care about, that matter to me. The immigrant experience is one of them. Right now, I am working on a memoir, in which I write about my childhood in Mexico, living in poverty, being raised by my grandmother because my parents were here in the United States working. I write aboutwhat it was like to come here as an illegal immigrant and the difficulties of trying to close the gap created by eight years of separation between me and my father. So to answer the question, yes, I do plan to continue writing about immigration and families, among other things. I am always looking for new ideas and topics. One has to grow as a writer, and one way to do that is to take chances and try new things. Even the book's dedication references a 'mariposa', and the references to butterflies very much mirror the associations I have had with them growing up, the writing engages you in the struggles of it's characters and I will warn you now, once you start, you will have trouble putting this book down! How to Win: (1) You must be a PUBLIC follower of Ascending Butterfly to be eligible for this and all giveaways. Indicate in your entry that you follow (if your 'comment name/user id' differs from your profile id, please let me know what name you follow under) and (2) In some Mexican cultures, butterflies represent extraordinary spiritual, magical creations that are believed to embody the spirits of the dead and the souls of deities. Tell us what Butterflies Represent to you! (3) You must also leave your email address somewhere in your comment. (You can format it this way for security, example: ascendingbutterfly AT mail host DOT com). (If your email is clearly visible in your profile, you can just say so, that's OK!) Please follow the easy 1, 2, 3 steps to winning! This giveaway is open to USA residents who are 18 years of age or older. Ƹ̵̡Ӝ̵̨̄Ʒ - NEW METHOD OF EXTRA CREDIT, (You can vote daily for extra credit): Ascending Butterfly is a nominee for the Bloggers Choice ’10 Awards in the ‘Best Blog About Stuff’ Category - http://bloggerschoiceawards.com/ -You can press the button below to go straight to the page where Ascending Butterfly has been nominated! FTC Disclosure Info for this Giveaway: This is not a paid insertion. This a non-compensated post and all opinions regarding this book are expressly my own experiences. I was provided with a book to review and the sponsor is also fulfilling to prize winner. Butterflies represent growth and change to me. I've had your button on my blog! I follow via email and google friend(missdeb1). Butterflies to me are a symbol of being free. I am a follower on face book under my real name thats in my profile. To me butterflies represent transformation of mind body and soul, mainly soul or spirit. People dont change much in body but mind and sould change constantly. Butterflies are more of a slow transformation symbolically due to the chrysalis stage of going from larve/worm/buttrfly. When the butterfly comes out its cacoon it is a transformed beautiful creature that was once ugly and weak and even its cacoon or husk can be used and transformed into fabric. It just is so beautiful. To me we as a race change dramatically every era or time period and as individuals we change and transform slowly and quickly and no matter how ugly or weak it may seem it is beautiful on the inside and something can always be gained from it. I follow your blog. To me, butterflies have always symbolized change, either mental, spiritual or physical. I'm a follower. Butterflies to me, mean freedom and a new beginning. To me, butterflies represent the cycle of life. I became a FB fan of Simon & Schuster and I left a message on the wall. Butterflies remind me of my Mum & Dad now passed as they loved to garden & always attracted butterflies. And butterflies represent freedom to me! I follow via GFC. Butterflies always symbolized freedom and flight to me. I follow publicly via google. Butterflies to me represent possibility and growth. I also find them simply beautiful. To me, butterflies represent nature, springtime and new life. I follow your blog. Butterflies represent beauty and freedom to me. I follow Simon and Schuster on Facebook and let them know you sent me.